What would happen if you could radically change how your business communicates? Could you find ways to react to market changes faster, deal with problems quicker, reduce internal chatter and noise in email, enable projects and teams to work more efficiently when not physically in the same building or office? There are lots of business drivers that have cost or profit benefits for business. 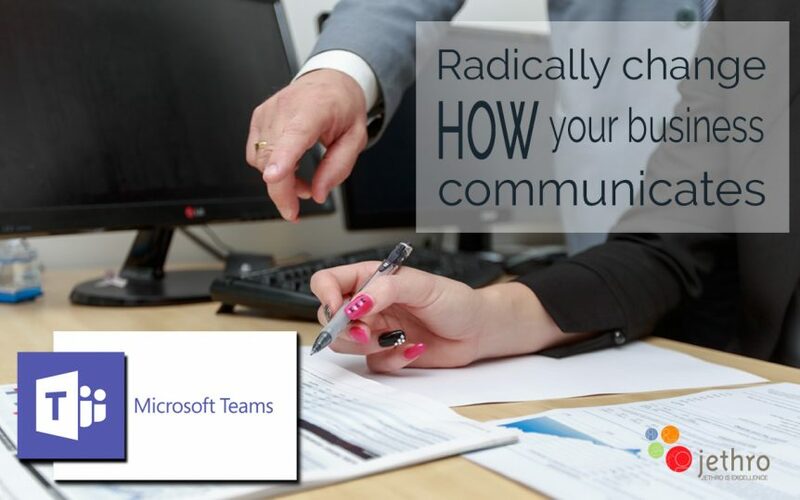 Microsoft Teams is enabling businesses to radically change how they communicate. How you ask? Let me explain the ways. Teams is an enabling platform. Don’t try and think of it as a thing, but rather a way. Its best described and explained using its functions. Teams is a place where we can coordinate all the business chat (intra business and between business) in one place, auditable and secure. Chat with your boss, employees, colleagues one on one or in groups. No more mixed platforms for conversations or “I didn’t get that message” etc. Some people incorrectly use Email for everything. We have all received quick responses to one person using the reply all on a team communication email. And the long threaded conversations with multiple branches and different versions of attached files. Microsoft Teams enables work groups or project groups to be almost instantly created (takes around 30 seconds) and contextual conversations to occur around jobs, files, projects, tasks, web pages, and more. These can last as long as necessary, and can be archived for historical access. If you need to discuss anything with more than one colleague or team member then using Teams to do that is very simple. Coordinating, creating and attending meetings is all part of business life. Most of us are used to using Outlook or some other calendar application to create meetings and invite people. But what happens to everything else? Agendas might be pasted in the original meeting invite but what happens when they change? People might accept expecting to be in the office, but then have to be out and now cant attend. Someone needs to take minutes but jots things down on a piece of paper and doesn’t include the specific task you were assigned. And then the time changes because of a scheduling conflict with a required attendee. You get the picture. Well let me say first up Teams doesn’t solve any of these problems. Humans make the problems and humans must solve them. BUT, Using teams as your meeting enablement platform seriously improves your ability to overcome a bunch of these issues. Connecting with a team meeting virtually via a Hi Def video conference on your mobile or tablet device, laptop or PC whether in or out of the office, overseas or right next door to each other makes a massive difference. You don’t need to book a meeting room any more. You don’t need to be in the same office building, city or even country. Meeting time changes? Easy. Attaching live agendas and editing them for all to see – easy. Enabling minute taking by all simultaneously – easy. Recording the meeting – easy. Sharing files from your device or from the cloud into the meeting for all to access – easy. Teams really is a meeting enabler that connects with so many other things. Integrations with Trello, Asana, Microsoft Stream, SharePoint, External websites, Hootsuite, GitHub, Survey Monkey and many more external applications are part of what makes Teams such an enabling platform. Essentially Teams becomes one place for managing and accessing all your team communications. External access is being upgraded and changed weekly (Microsoft are releasing weekly updates to the platform and the apps). External sharing is currently available in a limited way to anyone with an Office 365 business licence. Right now you can invite other Office 365 business users into your team as an external guest but at the moment other userss are not available. Microsoft is working on changing this. Are you ready to radically change how your business communicates? Microsoft Teams is free inside Office 365 and accessible to users with these licences with no additional cost. Turning it on is pretty simple (its probably on by default in most cases) and you can access Microsoft teams via a browser or a downloadable app for PC, Mac, iOS, Android or Windows Phone. Go to https://teams.microsoft.com and sign in to download or look for Microsoft Teams in your App store. Setting it up correctly requires some thought and planning and there are some gotchas. though there’s probably nothing wrong with giving it a go to play. However if you are already using SharePoint or Modern Groups then there are some definitely bad ways and good ways to integrate these and change things. You can convert existing Groups to a team and existing SharePoint sites created before Groups can be added to a new team. I like to explain it this way. Teams are created at a security level – e.g. who needs to be in this team? Create a team for those people only. Channels are then created at a functional level. OK in this team who needs to talk about sales? who needs to discuss this one specific client account, who is working on this mini project, who is collaborating on the team presentation to the board? etc. Channels are then accessible to all, but separate the discussion, workload, files and anything else so that you don’t see everything in the ne place, but can go to a specific spot for the relevant information. (in this way Teams mimics Slacks channels). Teams are collections of people, content, and tools that centre around different projects and jobs within an organization. In Microsoft Teams, team members can have conversations and share files, notes, and more, all in one place. Channels are there to help keep team conversations organized. You can dedicate channels to specific topics, projects, disciplines—whatever you like. I have listed a bunch of resources from Microsoft and others below – new stuff is coming all the time and with the rapid speed of change this list will likely be out of date fairly quickly.